The Yukon Salmon Sub-Committee is an advisory body consisting of 10 members appointed by the Minister of Fisheries and Oceans. The Yukon Fish and Wildlife Management Board assign from its membership one appointee of Yukon First Nations and one appointee of Government to the Sub-Committee. The Minister nominate two additional members, two members are nominated by the Yukon River drainage basin, two from the Alsek river drainage basin and two by the Porcupine River drainage basin. All members are appointed to the Sub-Committee for five years. The Yukon Salmon Sub-Committee is a forum for public involvement in all aspects of the management of salmon stocks and fisheries. Since its responsibility lies with issues that affect the entire Yukon, The Sub-Committee focuses its efforts on territorial policies, legislation, research and other measures to help guide management of salmon, conserve habitat and enhance renewable resources economy. The Sub-Committee, acting in the public interest, may make recommendations to the Minister and to Yukon First Nations on all matters related to Salmon and their habitats. Salmon fishing in the Yukon is governed by international treaties and a few interconnecting institutions that work together to preserve and enhance the territory’s salmon stocks. The Pacific Salmon Treaty (1985) and the Yukon River Annex to the treaty provide the framework for program management, stock conservation and harvest allocation for the Yukon River. In April 2001 Herb Dhaliwal, Minister of Fisheries and Oceans, announced that representatives of the United States and Canada had successfully ended sixteen years of negotiations on Yukon River salmon. Following negotiations, the delegations prepared and initialled the text of a Yukon River Salmon Agreement (YRSA) that addressed all fishing conservation and management issues, including harvest shares. This agreement provides certainty and stability for Yukon fishers with the first ever catch limits on interception of Canadian-origin Yukon River salmon. After ratification, the Parties officially signed the Yukon River Salmon Agreement in Washington, DC on December 4, 2002. The Yukon River Salmon Agreement outlines steps to ensure the future for Yukon River salmon through coordinated management, rebuilding plans and habitat protection. Salmon Sub-Committee members form the majority of the Canadian portion of the Yukon River Panel, which was re-established under the YRSA. The Panel makes recommendations to the Government of Canada and respective agencies in the U.S. on conservation and management of salmon originating in the Canadian portion of the Yukon River. Within the Yukon, the SSC is mandated by the Umbrella Final Agreement (UFA), an agreement between Yukon First Nations, and the federal and territorial governments. Members of the SSC come from all parts of the Yukon and represent both First Nation and non-First Nation populations. The composition of the ten-member Committee is laid out in the UFA and is carefully structured to ensure diversity and balance. The Yukon Salmon Committee is a forum for public involvement in all aspects of the management of salmon stocks and fisheries. 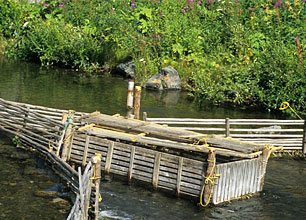 Fisheries and Oceans Canada is the federal government agency responsible for salmon management. They provide technical and administrative support to the Salmon Sub-Committee and administer the federal Fisheries Act, Regulations and Policies.